You can access the TranslatePress plugin settings in the administrator area in the menu under Settings -> TranslatePress. It can also be accessed both from the frontend and administrator area from the Admin Bar under the newly created button under the Settings drop-down. Select the original language from the drop-down your website was written in. 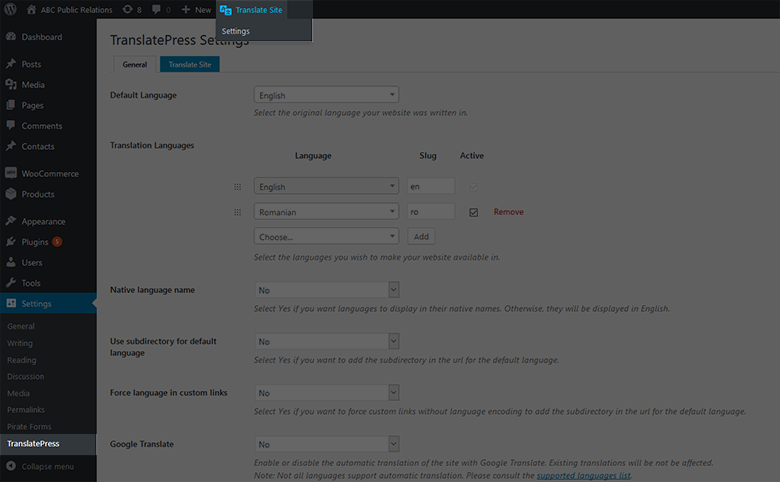 By default the language is inherited from the WordPress language that you can setup on install or change from Settings -> General. Interface which allows you to select the languages you wish to make your website available in. You just have to select the language from the drop-down and click the Add button. rearrange the order of the languages with the drag drop interface. This will determine the order in the language switcher floater and shortcode. Select Yes if you want to add the language slug in the url for the default language. Example www.myhomepage.com/en/ instead of www.myhomepage.com when visitors are viewing the site on its default language. Instead of directing the user to a pre-defined language, you can also redirect them to their preferred language using the Automatic Detection of User Language add-on. Note: Not all languages support automatic translation. Please consult the supported languages list. Input where you can enter the google translate API key. Visit this link to see how you can set up an API key, how to control the cost of usage and how to set HTTP referrer restrictions. Clicking on this tab will open the Translation Editor in the frontend of the site where you can begin translating your site.